The Honda D16Z6 engine is a 1.6 liter in-line 4 cylinder engine. This engine is created by Honda and is part of the “D Series” of engines. The Honda D engine family offered a variety of engines with displacements between 1.2 and 1.7 liters, with this family of engines being available until 2007. In the name D16Z6, the D represents the engine family while the 16 indicates the displacement, so 1.6 liters. 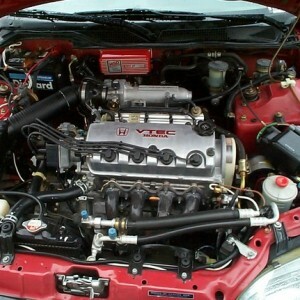 The D16Z6 engine was available in the Honda Civic and the Honda Del Sol. The stock version of this engine does not produce a lot of power, but many tuners like to take this engine and modify it to become a racer. This engine is a good candidate due to its lightweight and relative strength. The most common aftermarket part to add is the turbocharger, and other modifications, including modified parts, can also be performed. The D16Z6 engine itself was first produced in 1992. The first and most common car to be sold with this engine was the Honda Civic. This engine was available through 1996. The D-series in general was phased out in 2007. Many are particularly fond of the toughness of this engine. This engine is also a common candidate for street racing due to its lightweight, relative strength, and it can fit in the body of many smaller Hondas that could be ideal for this type of activity. As mentioned before, the D16Z6 engine is a 1.6L engine, but to be more specific the exact displacement was 1.59 liters, and 97 cubic inches. In stock condition this engine offered 125 horsepower at 6600 RPM and 106 lb-ft of torque at 5200 RPM. This is a reasonable amount of power for a naturally aspirated engine of this volume, giving a relative performance with max horsepower being 25% higher than the displacement in cubic inches. The redline for this engine is 7200 RPM, while the fuel is cutoff at just above 7400 RPM. This engine comes with a compression ratio of 9.2:1. Another feature of this engine is VTEC which is Honda’s version of the variable cam timing. The VTEC for this engine switches timing at 4800 RPM. The bore of this engine is 2.95 inches, which goes with a stroke of 3.54 inches. The Honda D16Z6 engine uses an aluminum alloy cylinder head as well as an aluminum cylinder head. The alloy construction helps keep the engine lighter, and light engines mean better acceleration and better fuel consumption. The Honda D16Z6 is a solid well-engineered engine. Depending on your needs this may or may not be the engine you want. Due to its overall small displacement and the fact that it is naturally aspirated, the stock engine does not provide a large amount of power. That being said, the engine is light and provides good fuel economy, so people just wanting a reliable engine to get them from point A to point B would be fine with this engine. The other side of the coin is that the strength and lightness of this engine allow it to be an option for tuning and racing.